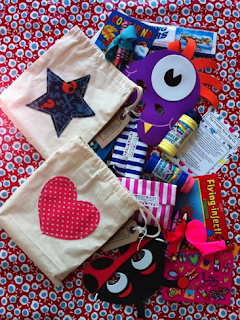 The Friendly Party Bag Co.: The Friendly Party Bag Co Donations to Summer Fair's!!! The Friendly Party Bag Co Donations to Summer Fair's!!! This week we have been busy, sending out donations to a few Summer Fairs, we would like to thank: The Lynda Ellis Kids Unlimited Nursery Sheffield, St Joseph's Catholic Primary School Maida Vale and St Pauls C of E Primary School Chipperfield for their support. We hope the Summer Fair is a huge success!! As you can see the contents are similar for boys and girls, this is to stop the fighting!!! We are offering an introductory offer our first 50 orders only £6 per bag!!! A B C ........ matching bags and bunting!